The CAS Program at Ermitage needs your help! 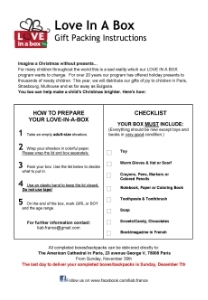 Students are participating in a Paris-wide service initiative called Love in a Box. Love in a Box is literally what it means, we share our love by packing it up in colorful boxes! This student-led CAS project involves sending holiday gift boxes full of useful and fun items to needy children in Paris and orphanages around France as well as abroad. 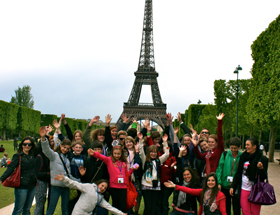 We hope to get all grade levels of the International Studies Program involved . Here is how it works - Click the image below for downloadable PDF instructions. Use an elastic band or ribbon to close the box. Place a label on the end of the box, marked GIRL or BOY, please also indicate the age. Decorate / Wrap the shoebox in colorful paper. Wrap the lid and box separately. CAS students will be collecting boxes starting Monday November 24th. Final deadline for boxes is Friday, December 5, 2014!